I started writing this entry a few days ago, sitting here, trying to find a quirky way to start this word-vomit as I usually do with my writings, but I couldn’t seem to come up with anything. I’ve been too busy, tired, and deeply in thought to think of any clever title or grabby introduction in advance. Plus, my right ear hurts. It’s as if I’m stabbed by an icicle in there. Hooray for an ear infection, as my doctor confirmed yesterday. It’s a bit ironic that it’s something that babies get, yet mine haven’t. Yet. Criminy Christmas. I love this man. I am so happy that we got to spend some rare and much needed time together last week. 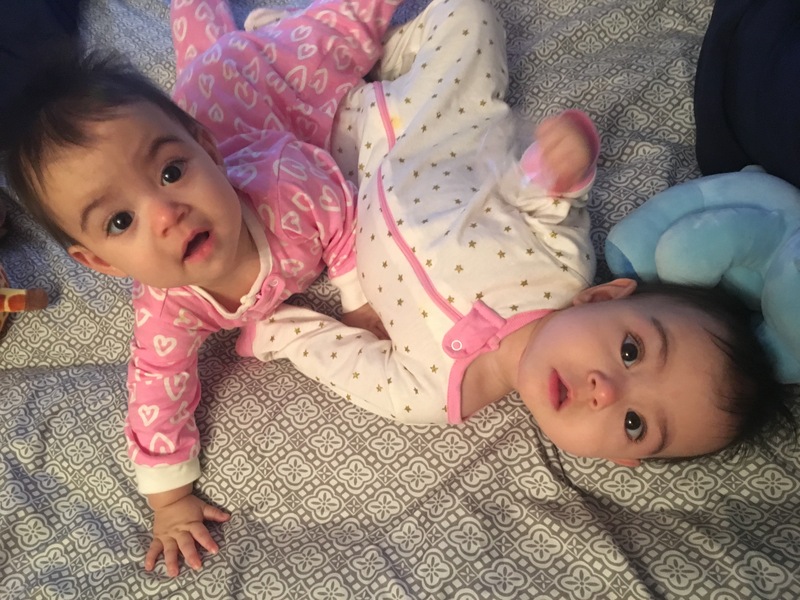 We went on two – yep, two – dates while my mom was up here, watching the babies. We had so much fun together. It felt like the days before kids, except the majority of what came out of our mouths had to do with them. 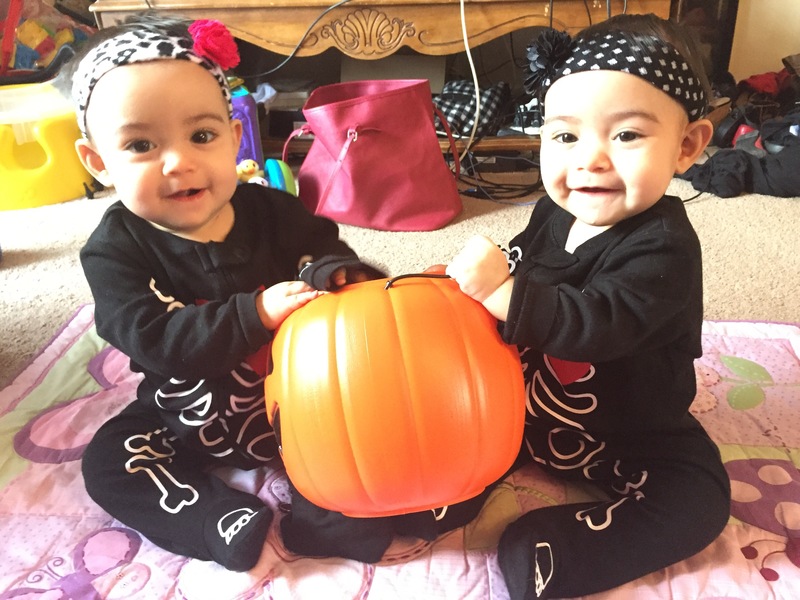 They’re just too cute, and we’re both still in disbelief that we had twins. I’m sure it’ll sink in once they’re about to leave the house for college in eighteen years. But, until then, we’ll just stare at their adorableness and wonder just how in the hell we were so lucky to have them. Cutest skeletons you’ll ever see. I’ve hit a wall in regards to work. I am beyond thrilled to go back down to a part-time position in one week, except for the pay cut. I still wish I could work early mornings or late nights, not needing to shell out the money for babysitters and spend more time with the girls. I often wonder if it’s worth it missing out of their babyhood just so I can use the majority of my paycheck for childcare. That’s not even including diapers or formula – that’s mixed in with where the remainder of my paycheck gets spend, on groceries and baby needs. The two major things that are truly and honestly keeping me at work right now are the fact Rick and I have paid round trip tickets to Japan waiting for us in May, and the fact that I have my health insurance for myself alone through my job. The health insurance saves us a lot of money per month, it’s basically the “deal breaker” that financially required me to return to work. The paid round trip tickets are something my company did for its employees when we won Airline of the Year in 2016, and it’s a treat we really wish to enjoy because we deserve it. We’ve been dying to go to Japan, and here’s our chance to do it with much less stress (standby flying is a nightmare) and less cost. It makes me even more frustrated because of recent delays we’ve had that have kept me at work until eleven o’clock at night, hours after my shift ended, having to stay because I’m the supervisor for the shift. It infuriates me that I have to miss putting the girls to bed and not see them for a day sometimes, all because a flight or two have been delayed or cancelled. The annoying drama that sometimes comes out of work due to unique circumstances also put me over the edge. I want to do nothing but drop everything and come home to my priorities, my real full-time job. Nobody knows how to care for your children like you do, it’s just a fact. I know that me working is a needed sacrifice right now, so what else am I left to do? Work and complain a little, which is fine. Again, I can’t wait to go back to being a regular part-time employee this coming Monday the 23rd. Less hours (and, unfortunately, less money) per week, a little more time with the girls, a better chance at being able to leave early. Speaking of the girls, these two are amazing. They never fail to entertain and impress us as we watch them grow every day. We’re up to solid food twice a day as a bare minimum, and we’ve been enforcing a third solid food time for a few days as per their pediatrician’s request. They’re a lot more active, dislike lying down, love sitting up and bouncing around. They’ve both been clapping for about two weeks now, their giggles are even sweeter. River has started to say the “n” consonant, and it sounds like she’s constantly saying the Portuguese word for “baby”, “nenê”. It’s the funniest thing right now. Lydia is still going strong with her “dada”s and “mama”s, and my heart continues to melt every time she says it. Something funny happened last night. River had become attached to a clear, plastic cup when Rick took the girls to Syracuse by himself a couple of weekends ago, and we’ve let her go down for the night with it. We’ve become accustomed to the funny clunking sounds of her smashing it against her crib before falling asleep, and hearing her talk to it before passing out. Well, since Lydia had been playing with the cup all day yesterday, we inevitably put her in her crib with said plastic cup. River wouldn’t stop crying at bedtime last night, and it took us a little while to figure out why. She didn’t have the cup. I kid you not, as soon as that plastic cup went into her tiny, angry little hands, she soothed herself and fell asleep within minutes. Of course, Rick and I were trying not to wake the girls up as we laughed our asses off at that discovery, and we’ve added a plastic cup sleeve to our grocery list. As for me, I’m having a hard time keeping up with things lately. My wonderful blog, my self care, future engagements and events – it all just feels like a blur. I sadly feel like I rush through things to get them done, go to bed, and wake up only to do the same thing every day. It’s exhausting. Getting buried in questions regarding schedules with the girls, if we’re getting any rest, if we’re moving to a bigger house anytime soon, and things relating to work – it makes it all kind of hard to breathe. I admit there has been jealousy when it comes to people I know that own bigger houses with their perfect little families, people who seem to have it together better than we do. And I am aware that they all had to start somewhere, I just feel like that’s always been my stage in life, stuck at the “starting point” for at least the past 8 years. I’ve also had to mute my brain when the thought of “we would’ve had it so much easier if we hadn’t had twins” crosses my mind, but I honestly wouldn’t have had it any other way. I’d never be able to imagine life with only River or only Lydia, or with a different baby altogether had we decided to wait longer to have babies. I guess I’m just tired. Tired of hearing the same “encouragement” from others, the “been there, done that” that comes from literally everyone. Tired of asking myself if things we do are even worth it, if it’s palpable to even consider new career paths or even going back to school. Sometimes, it’s better to not hear anything from anyone. Sometimes, I wish I had all the advice in the world. But as I get around to finally finishing this entry, which I started two days ago and stopped because my thoughts were too scattered to put into writing, the girls are finally napping, there’s somebody mowing the lawn outside, and I’ve had to discipline the dog for barking as soon as the girls fell asleep. Feels a little weird typing this in my big desktop computer, which I hadn’t turned on in nearly 6 months because of lack of time. Feels weird having a little time to finally think today, in between the jabs and stabs in my right ear.